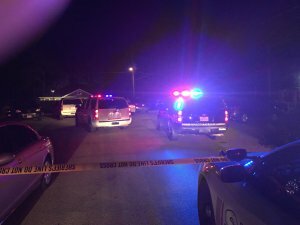 Just before midnight Montgomery County Sheriff’s Office responded to a shooting at a party on Jonathan Dalton in the Timberland Subdivision. They arrived to find a male shot in the leg and side. He was transported to St.Lukes Hospital in The Woodlands. A female was who was conscious and talking was also removed by a second ambulance about 30-minutes later. Detectives are just arriving on the scene. The shooter is described as a Hispanic Male who fled in a silver Grand Prix or Grand Am and is believed to be heading to the North Houston area. Any one with information is asked to call the Montgomery County Sheriff’s Office or Crime Stoppers.